Park Regis City Quays invites you to discover Cairns and surrounds by providing the ultimate base to explore the coast during your next visit. With the Esplanade, harbour foreshore, many restaurants, shops and cafes plus night markets, Reef Casino and Marlin Marina merely a short stroll away; you are close to everything that makes Cairns the ideal destination. Spectacular sights and experiences await you in Cairns, take advantage of Park Regis City Quays’ tour booking service and find yourself snorkelling the Great Barrier Reef, sailing the crystal blue water on a catamaran or white water rafting on the Tully and Barron Rivers…the options are endless. Whether your stay is for business or pleasure (or a bit of both) – Park Regis City Quays is your ideal ‘home away from home’ whilst in Cairns. Extended and long stay guests are welcome at Park Regis City Quays - click here for more information. For guests attending tradeshows, conferences and other events, Cairns Convention Centre is conveniently located directly across the street from the hotel. Relax and unwind in your modern hotel room or one/two bedroom self-contained apartment – all with individually controlled air-conditioning as well as ceiling fans, complimentary Wi-Fi Access (Up to 1GB), cable TV and most with large balconies. To enhance our guests’ experience, our superior rooms have recently been given a fresh new look including new pillow top beds and bedding, modern desks/work areas and new technologies such as iPod docking stations and high definition LCD TVs. Make the most of Cairns’ fantastic weather and cook up a classic Aussie meal at our rooftop sundeck and BBQ area. Afterwards, take a relaxing and refreshing dip in our outdoor swimming pool – perfection! Visit the Park Regis City Quays website here. Get in quick, this exclusive sale will save you 10% off with guaranteed early check in and late check out. Get in quick as it’s only available for a limited time! 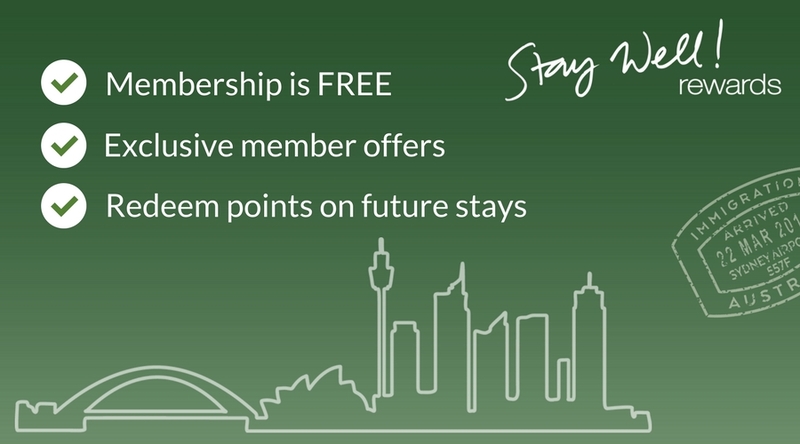 For new and existing Stay Well Rewards card holders (free to join!). Receive even more discount off our 2 night offer. For new members, we'll sign you up when you arrive.